This recipe is a bit of an unusual spin on a traditional salad that might be better known with blue cheese or feta! I know some people are adverse to fruit in a salad but I personally really love it. This salad is particularly sweet though and the combination of raspberry and vanilla makes me think of desert! The peppery rocket contrasts really well to the sweetness of the candied walnuts too, which add a satisfying crunch! The colour of the dressing is absolutely amazing too - it totally brightens up the bowl, while giving the salad a tangy finish. Like all good salads, it is easy to throw together, taking about 10 minutes all together to make. I love it by itself, but it is a great accompaniment to any summer salad buffet too. Peel the pairs and cut them in half. Then slice the halves lengthways and put into a pan with the vanilla, coconut sugar and water. Turn on the heat and allow to simmer for around 5 minutes, or until they are soft enough to cut with the edge of a spoon, but not beginning to disintegrate. Line a tray with baking paper. Break up the walnuts, then mix them in a cup with the maple syrup. Lay them on the baking tray and place in the oven for about 5 minutes, allowing the maple to caramelise, but removing before they brown. Place all of the ingredients for the dressing in a blender and blend until smooth. You can add a little extra water to get your desired consistency if necessary. 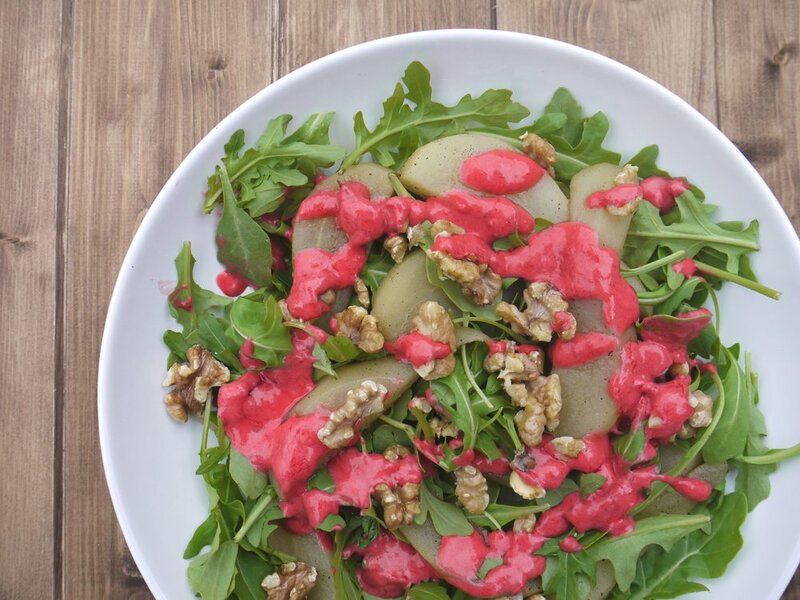 Then line the bowls with rocket, add the pears and walnuts and dress to serve.